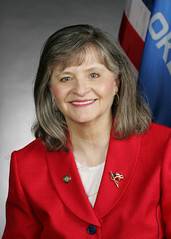 Will state Rep. Sally Kern (R-Oklahoma City) escape any real political damage over her racist and sexist comments on the floor of the Oklahoma House of Representatives? Her outrageous comments made national news and drew widespread criticism. But this isn’t the first time the legislator has brought critical attention to herself and the state. Kern was recorded at event in 2008 arguing that the homosexual agenda was a worst threat to the nation that terrorism. She also said, “”Studies show no society that has totally embraced homosexuality has lasted more than a few decades.” Here’s a recording of her comments. Her intolerant comments sparked outraged throughout the world. Television show host Ellen DeGeneres, for example, took issue with Kern’s remarks. DeGeneres played some of Kern’s remarks, mocked them, and then tried to call her. Kern was stopped from entering the state Capitol in March 2008 when it was discovered she was carrying a gun. She argued that she had simply forgotten she was carrying the weapon. If the assignment given by a teacher involves writing a poem, the work of a student who submits a poem in the form of a prayer (for example, a psalm) should be judged on the basis of academic standards, including literary quality, and not penalized or rewarded on account of its religious content. WHEREAS, alarmed that the Government of the United States of America is forsaking the rich Christian heritage upon which this nation was built; . . .
Kern provoked the anger of civil rights and Muslim groups this year for pushing legislation that tried to get around a judge’s decision to issue an injunction against a constitutional amendment, passed by voters, that would ban the use of Sharia law in Oklahoma. Here’s a Slate article about the issue. Her comments, for which she later apologized, prompted the local chapter of the National Association for the Advancement of Colored People (NAACP) to call for her resignation. The Oklahoma Democratic Party has also called for her resignation, and other prominent politicians want her to be at least reprimanded by the GOP leadership. « On Universities And Such, Or, If Obama's A Kettle, Is Donald Trump Black?